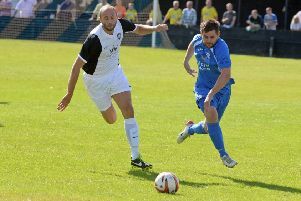 Craig Denton was left feeling slightly disappointed despite Worksop’s opening day 2-1 win at Goole. Jamie Price had put Worksop ahead before the home side levelled through Adam Lund. But Kyle Jordan got the winner after Steve Wooley’s shot hit him and deflected in. But despite the win, Denton was unhappy with aspects of the performance. “I’m a little bit disappointed to be fair, the first half an hour we were making decisions that we haven’t all pre-season and seemed to go off-script,” he said. “We know that they were a few nerves, there’s fantastic travelling support and it brings a lot of pressure to play for Worksop Town. “We came in after the first half and had a little chat, ironed out a few things and put in a better performance. At the end of the day it’s all about the three points for us. “When you’re not playing so well and winning games they all count, there’s loads for us to work on but I’m just glad to get the first game out of the way and we can crack on now. “I thought our two centre halves did well, but the back four took 20-30 minutes to get into the game. After a scrappy first half Denton said nerves were possibly the reason for the team going ‘off-script’ but he was pleased with an improved second half. A smart bit of play from Mark Simpson then resulted in Craig Mitchell forcing a corner after his effort was squirmed off the line. A deep high kick came in and caused confusion in the home side’s box, the ball skittled around off several defenders before captain Price blasted the ball in to break the deadlock. Just minutes later Goole forced a corner of their own, Dave Reay seemed to get a knock to the head and wasn’t able to gather the ball cleanly leaving defender Lund to volley in the equaliser for the Vikings. All the late first half drama made for an interesting second half. Nothing much occurred until the double substitution of Kyle Jordan and Connor Brunt replaced Templeton and Simpson. Woolley was the catalyst after a delightful drop of the shoulder on his way to the box which then saw him unleash a left footed drive which found its way into the bottom corner after a deflection off the lurking Jordan with the striker knowing nothing about it. Worksop dropped deeper and saw the game out successfully despite a nervy ending, Gooles Marcel Chigumira and Derry Robson a lively threat in the final third but the Tigers held on for an opening day win.